In September 2010, UK scientists breathed a sigh of relief when the government froze science spending at £4.6 billion. But for a growth agenda that aims to build industry from science, is this enough? Purse String Theory (PST) began in October 2011, one year after the government froze the science budget at £4.6 billion – a real-terms cut of £1.7 billion. We set out to explore the ongoing funding debate among scientists, lobbyists, politicians and academics. In this mini-series of posts, each PST contributor reflects on the journey thus far. Is this new science funding lobby needed beyond May 15? The forthcoming EPSRC protest march on Parliament Square has certainly sparked conversation among the science policy community. And some people are questioning whether the rally on May 15 can lay a firm foundation for the proposed new lobby group behind it, Science For The Future. Back when we started Purse String Theory in October, I was uninitiated to the world of UK science funding – a system that I’ve been told is impressively complicated compared to that of other countries. And as a new transplant to the UK, I was still learning the basics of governmental spending and operations. Since then, we contributors have immersed ourselves in the news and debates to do with science funding, taken on areas of specialism within our reporting, and become players in those debates. PST now feels like an ecosystem that grows organically, fed by interactions among us three contributors and the readership we’ve built up. A few things stand out as interesting lessons learned. 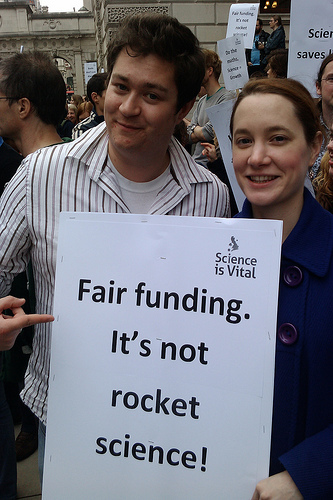 The Science is Vital campaign from 2010. A new science group is set to march parliament next month. Scientists from across the UK are planning a rally in Parliament Square on May 15. In a document seen by PST, the researchers describe how they are planning to lobby against what they see as the EPSRC’s “flawed approach” to funding. The lobby day is thought to be the next stage in the fight scientists are picking with the EPSRC, after publishing an open letter of criticism against the body in January. When I first started PST I didn’t expect to find much. While the chancellor’s cuts were forcing libraries and daycare centres to close, the science budget was ring-fenced – the scientists were the lucky ones! And yet digging deeper and deeper into the policy world through face-to-face meetings, phone calls and the lively #scipolicy hashtag on Twitter, I’ve realised that science funding is a very rich topic indeed. David Willetts may form science funding policy as a way of rousing the UK economy, but Nicolas Sarkozy seems happy just to have “world-class research champions”. That is one conclusion to draw from the unscientific analysis below, which posits the top 25 keywords in recent science policy announcements by Willetts against those of the incumbent French president. The Brazilian government has pledged $2bn to encourage students to consider careers in science, technology, engineering and maths (STEM) by launching its Science Without Borders programme. The future of Science for the Future. Discuss. Receive Purse String Theory by email.